We know we normally focus on the live music that can be seen and heard in Seattle, hence our name, but we wanted to take a step away from the normal to focus on something special that starts this weekend. 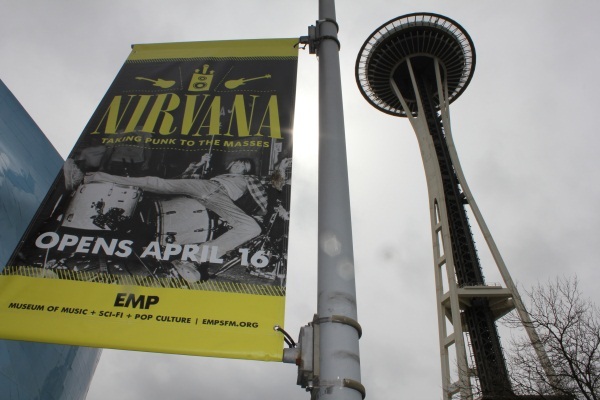 Earlier this week we were lucky enough to get a sneak preview of EMP’s new exhibit, Nirvana: Taking Punk to the Masses. As we met senior curator Jacob McMurray, who was kind enough to serve as our exceedingly knowledgeable guide, we were immediately struck by the overall look and feel of the exhibit. 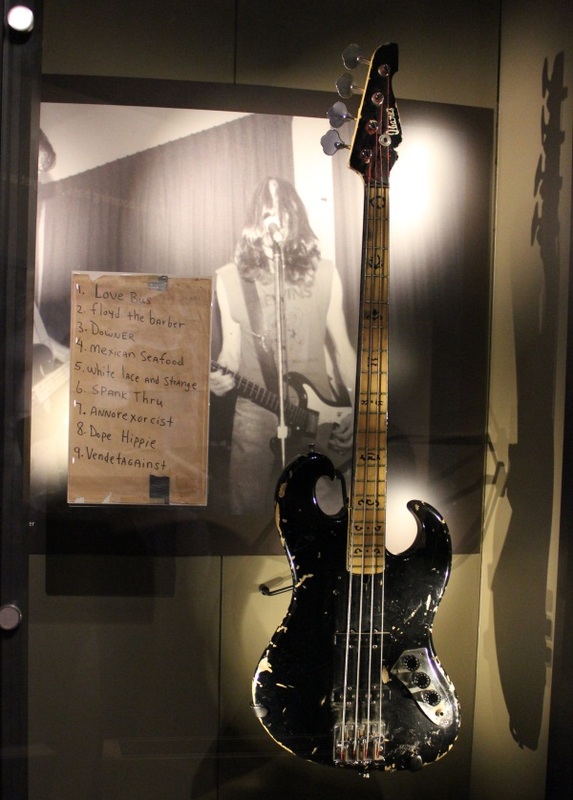 As our eyes took in the evocative quotes, striking photos and enough memorabilia to turn the Hard Rock franchise green, our ears tuned into the 22 channel hour long audio soundscape created by famed Nirvana producer Steve Fisk. One of the things that is immediately clear is the amount of work that went into making this exhibit pitch perfect. The attention to detail meticulous, the editorial decisions spot on. One such demonstration of this commitment is apparent in the numerous video interviews with a great number of individuals who have some part in this story. Some seemingly small, others huge. 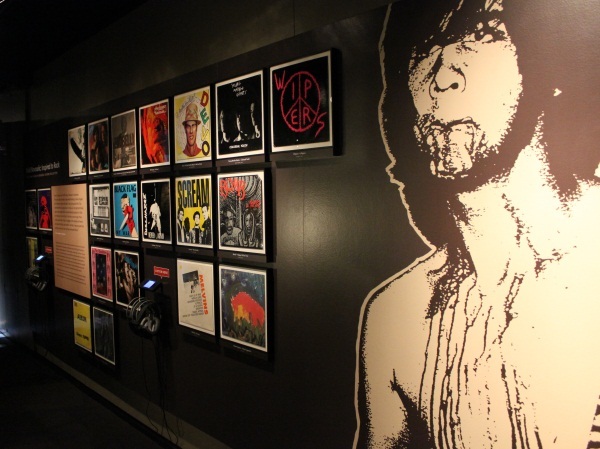 In all, McMurray tells us the exhibit features over 100 new and archive interviews with the likes of Krist Novoselic, Jack Endino, Steve Fisk, Ian Mackye, Butch Vig and many, many others. As we don’t want to give away too much, we’ll cut our prose short and let the below photos reveal a bit more. All in all, the exhibit is one of the most impressive that we’ve seen in quite some time. 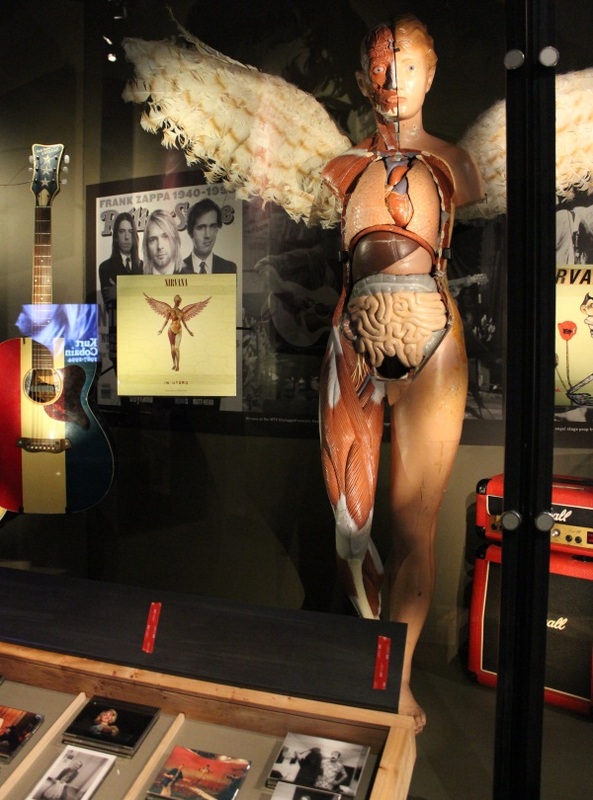 While Nirvana fans will no doubt delight in the experience, the space has enough eye candy and interactive displays to woo even those who don’t walk in as fans. 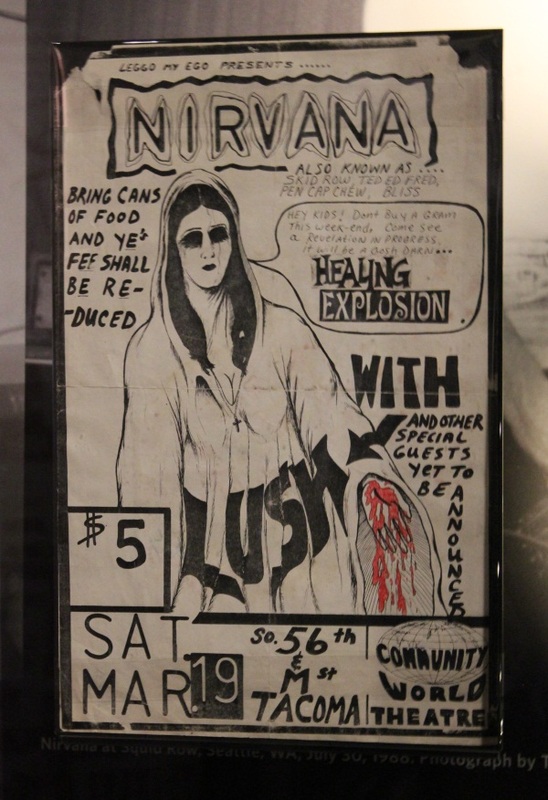 Tomorrow, the EMP will reveal “Nirvana: Taking Punk To The Masses,” their newest exhibit. 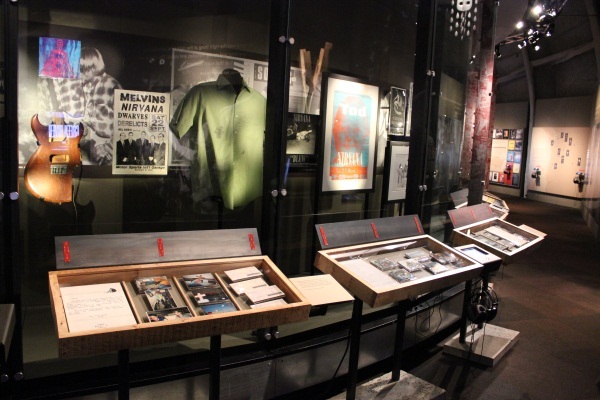 The exhibit is intimate but offers an incredible amount of memorabilia and music to enjoy. 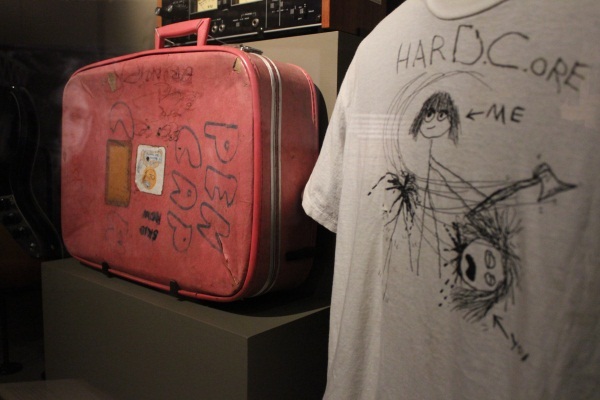 One of Dave Grohl’s “custom” t-shirts in the foreground, with “custom” baggage artwork. A bass and set list from Skid Row, Nirvana’s alias before they settled on their well-known moniker. 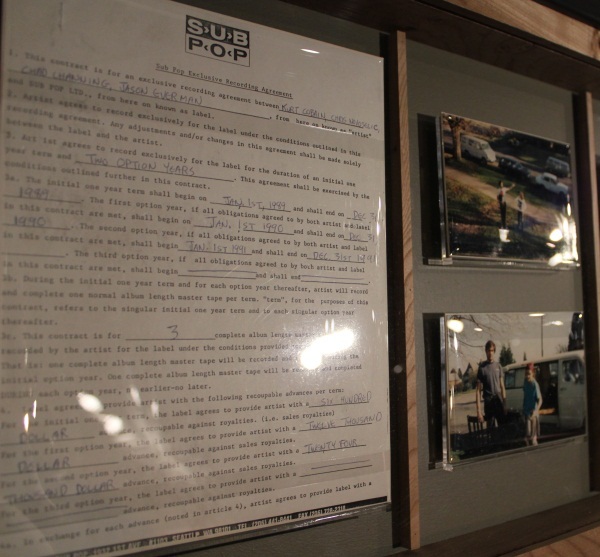 Nirvana’s first record contract, which also happened to be Sub Pop’s first record contract. One of several listening stations where you can hear music that impacted Nirvana’s abrupt rise to fame. 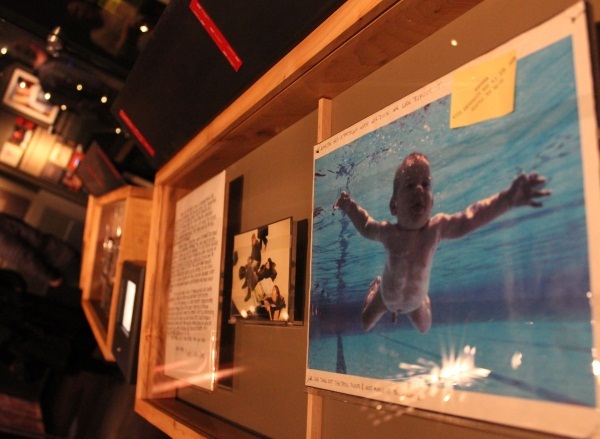 The original print for the cover of “Nevermind” will be a favorite artifact for fans. 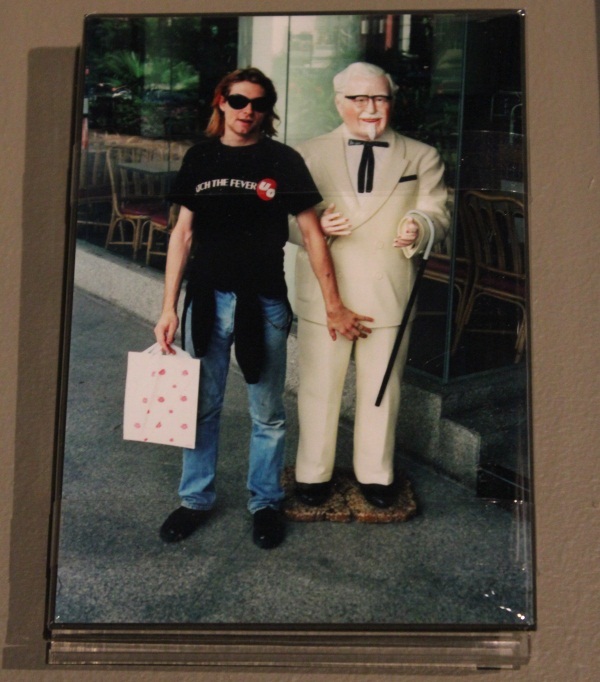 The exhibit has an amazing collection of personal photos from the band, like this one of Kurt and the Colonel himself. A couple angels from “In Utero” can be found watching over the exhibit. 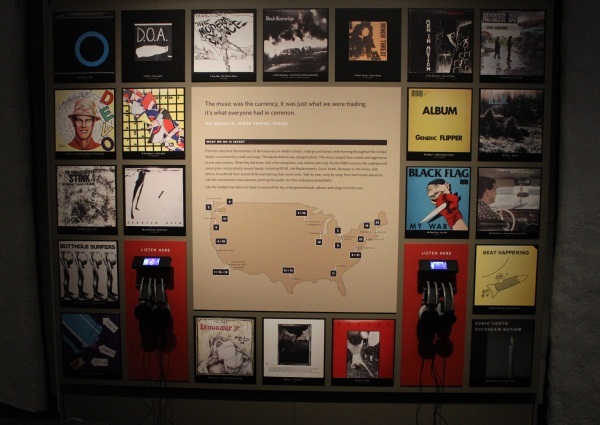 One wall features the top albums that Krist Novolesic found most influential during the era of Nirvana. 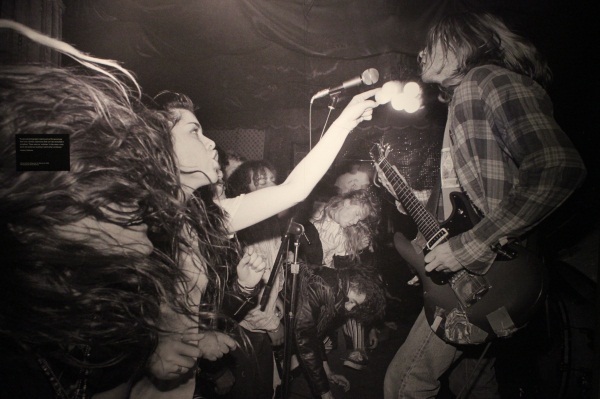 One of the many arresting large-scale photographs of Nirvana in their element.